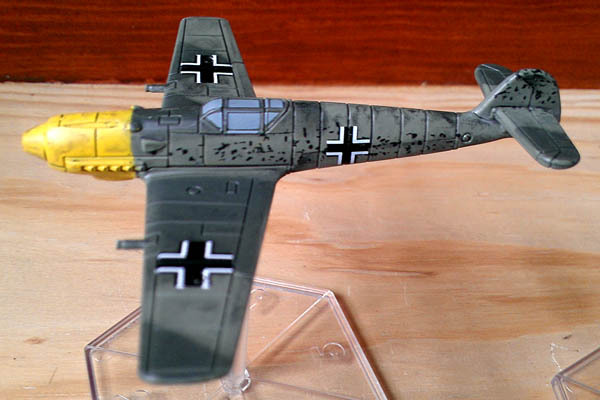 Modeling and painting has always been as big a draw to the hobby as the actual games. I have played some boardgames thought, including a lot of the original Axis & Allies in my youth. In fact, there are probably still a few stray dice hidden around my parents house from getting thrown in frustration by my teenage self. I have watched as games with pre-painted figures have steadily improved over the past decade, in terms of the quality of figures and painting. 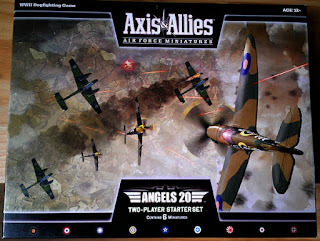 Since my time is limited and not much painting is done, and since I am working for an aviation museum and contemplating ways to get some game-days at out facility (and maybe some games stocked in the gift shop,) Angels 20 seemed like something I really needed to check out. The store owner gave me a run down of the game mechanics, which took all of about ten minutes. Reading through the instructions, there are a few additional details & optional rules, but all in all the game seems simple to learn & quick to play. The starter box comes with the instructions, two game maps (the game is played on a hexagon based map,) a small sheet of card counters, a deck of cards with the stats for each of 30 planes in the first release, and six planes with clear plastic flight stands. The "booster" sets are blind boxed, containing three random planes. I'm not really fond of that arrangement as I think it's a gimmiky way of selling a product. I haven't bought anything beyond the starter, and will hold off until I try out a few games. I'm bringing it to Cold Wars for some casual evening gaming with friends. 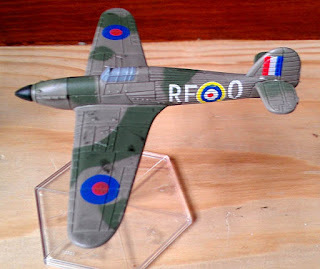 If I enjoy the game and do well at the flea market, who knows, maybe I will pick up a few extra planes. I may just wait to see what happens with a secondary market & picking specific planes second hand. Here's a few (phone camera) photos of some of the planes. I think the quality on them is excellent. The flight stands have 6 numbered faces, to be rotated so that the number at the plane's 12 o'clock position is the altitude. The planes have a socket, and the top of the stand has a ball, so that the planes can pivot on the joint indicating banking, diving, climbing, etc. That's a nice arrangement, but I think I can do better. I will most likely mount a steel nut or other piece of hardware in the plane's socket so that I can use the magnetic telescoping stands I got from CorSec Engineering, for use in my WWI Blue Max/Canvas Eagles project. I will report back in another week or two, when we've had a chance to try the game out. "I will report back in another week or two, when we've had a chance to try the game out." A year later, I'm still waiting... did you hate it that much?